This means that initially a small, low quality image is loaded on the page, and this is then replaced (after load) by a higher quality version, but only if required (if the element is actually in view of the user). That’s the ‘progressive’ part. If the user scrolls, rotates or resizes the page, this process is repeated for all visible elements, either adjusting them up or down. This is the ‘responsive’ part. Prime is an evolution of prImages and it was written with cimage in mind as an image-generating backend, but can easily be adapted to either pre-rendered images, or another resizing/thumbnail library. Prime’s image fitting works by matching the actual dimensions of an element upwards to common responsive width breakpoints (160, 320, 480, 768, 1024, 1224, 1824, 1920 pixels, so a width of 600px would be matched to 768px, and so forth) as opposed to what width would be available. This prevents a plethora of image sizes to be generated, by effectively limiting them to 8 versions per image (9 if you include the original). Pixel ratio of the browsing device is also taken into account; image sizes are doubled when pixelratio is higher than 1. As an example (based on a desktop browser, at 1920×1080); If all images on this page would be loaded in the old-fashioned, regular way, the page would consist of 16.3 MB worth of html and 33 (high-quality, 16.2 MB) images, taking at around 1.1 minute(!) to fully load on a 2.0MB/s connection, or 5.65 seconds on a 30MB/s connection. With Prime, that page now weighs in at a total of 810 KB, including 33 (low-quality) images, of which only 2 are loaded in HQ immediately (the top logo and the first image, which is in view), making a total of 35 images, taking up 572 KB. To fully load the page, this takes on average around 2.26 seconds on a 2.0MB/s connection, or 489 ms on a 30MB/s connection. This means the pageload, without any user interaction, is 96.5% smaller and around 91.3% to 96.5% faster, depending on connection type (!). Furthermore, if the user does not scroll the page, they never require the remaining 15.7 MB, potentially saving heaps of bandwidth on a busy website. 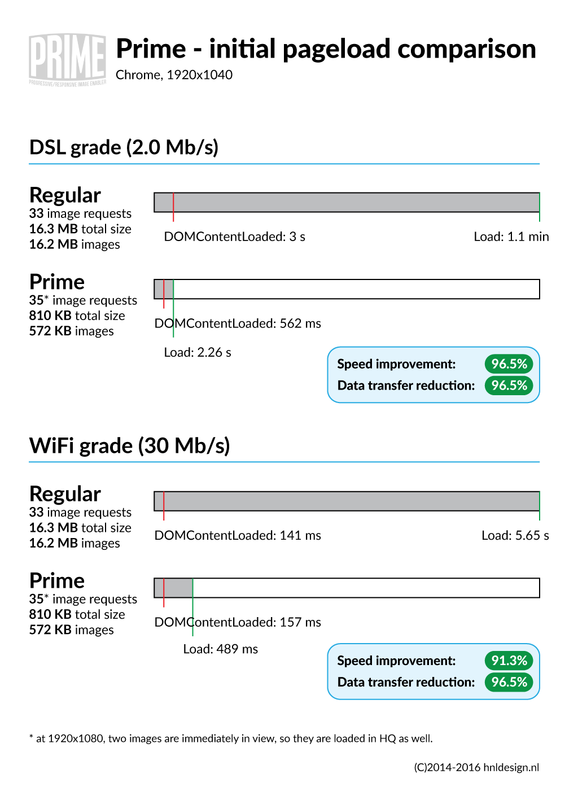 Even after scrolling through the whole page, data transfer is still only 8.2 MB (8,0 MB images) as opposed to 16.3 MB, because of better image fitting (see below), saving a total of 51% on data transferred. When a webpage loads, it displays as soon as text and css are loaded, and requested for all other resources are made. This means that a page will show without waiting for images to finish loading. This produces (if no dimensions were set on the <img> elements) content-shift, which can be highly annoying. 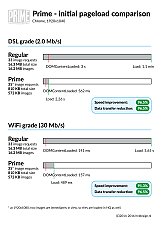 The progressive aspect of Prime enables you to initially set small, low quality placeholders while we wait for Prime to finish loading the high quality images. As these placeholders are (a lot) smaller than their HQ counterparts, they load much, much faster as well, limiting content-shift to an absolute minimum. That said, I would still recommend taking other precautions, such as setting intrinsic ratio for all images. Prime circumvents this by checking the container size, and matching that to its breakpoints, producing an image that fits the current resolution/dimensions, without loading the highest quality image, per se. Say an element is 460px wide in the current user’s viewport, and the original image is 1024px wide, Prime will match that 460px to its breakpoints, resulting in a width of 480px, and then lets the browser load this image. This produces an image that weighs less than the original and looks perfect. Ofcourse, if you set a fixed size for the image element, Prime will not exceed that limit. This gallery is a demonstration of prime, with both div and img elements and debug-info on changes and dimensions. Resize, scroll and reload the page to see it in action. Usage is fairly simple if you follow these basic steps (or fork and rewrite the script to your liking). And then using a php-file (image-handler.php in the above example) that handles the parameters and outputs an image. Check out the demo gallery if you can’t work it out. SetupDone: Prime is done setting up everything, and is about to process all images. ProcessAll: Prime is about to process all images, triggered either scroll, resize, orientationchangeor docready events. NothingToProcess: Prime has evaluated all images and found nothing that needs (re)processing. AllLoaded: All required images were loaded and replaced. Error: Image loading has failed. For all events, the event’s details are set in the details object (e.details in the above event handler examples). The class for each image (prime-img) is essential, as the script will select elements using that class. data-ratio the ratio of the image (height/width) can be specified either as 4:3, 16:9 or as 1.4, 1.66 etc.